The First edition of Leblon Gastronômico includes live music, beer stalls and food trucks from 2PM to 10PM this Saturday and Sunday. RIO DE JANEIRO, BRAZIL – On Saturday, June 3rd and Sunday, June 4th, Leblon will host the first Leblon Gastronômico, an event dedicated to food and music. Taking place on Avenida Bartolomeu Mitre, Leblon Gastronômico will bring together over ten food trucks and nine homemade beer stalls as well as live bands. Band Be Ritto performs at Leblon Gastronômico on Saturday (June 3rd), press photo. Starting at 2PM a wide variety of dishes and beverages can be found at the festival on both days. Burgers, snacks and traditional Brazilian fare will be offered at the food trucks Big Daddy’s, Degusta, Ducas Homemade, Espírito de Porco, among others. Sweets and desserts can be found with Brigadeiro Chef, Brigaderia Aconchego, Quero Churros!, and Sorvete na Chapa stalls. For those who appreciate good craft beers, the event will offer a wide variety of Brazilian specialty labels, such as Allegra, Cevadas, Cidade Imperial, Colorado, Imperatriz, Mistura, Mohave, Noi and Paulistania. Visitors can also taste some wine at the Love Wine brand’s stall. The festival will run until the late evening and offer a variety of attractions, including live music. On Saturday (June 3rd), band Be Ritto will be playing sertanejo (Brazil’s folk music) and pop. 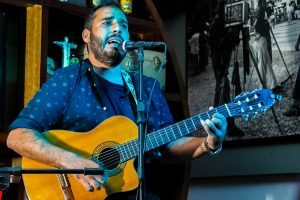 On Sunday (June 4th), group Trio Ventura will entertain the audience with the best of traditional and contemporary forró at 6:30 PM, promising to get the crowd dancing and liven up the event. Leblon Gastronômico will also include cultural activities for children and on Sunday at 1PM theater group Papa Vento will present a puppet show. The event is organized by Fala Entretenimento, and has the support of Rio Tour, CET Rio (Rio’s Operations Center), SEOP (Rio’s Public Order Bureau).